THE CAPACITY is big enough to hold thermos, sandwich,diaper and small snack(max).If you took those small waters or a juice box you'd be able to fit a bit more. COMFORTABLE Adjustable backpack strap let you easily have all things on your back. Straps' width are just wide enough to bear the weight on back, making your kid's hands are free to hold the parent's hand. SPACIOUS and FUNCTIONAL With 12pockets,6 outer pockets,6 inner pockets, this is one of the most spacious baby diapers backpack on the market without being too bulky. BEST GIFT CHOICE Cute and fashion design as a birthday gift to your kids and they would love it. *BPA and Phthalate Free Material: PU Leather. 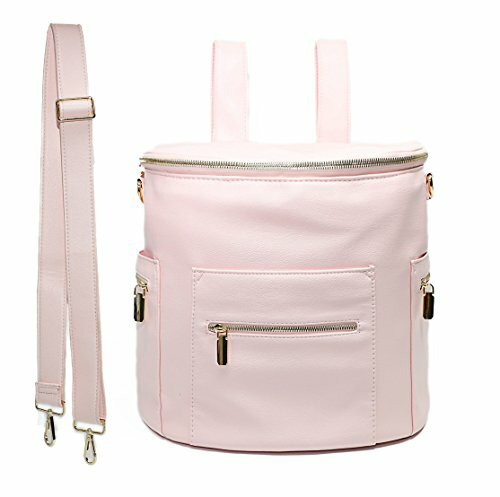 *LIGHT WIEGHT, CLOSE FITTING Zipper closure--This cute and fashion toddler back pack is great for ages 2-8 years kid girls and boys. *ADJUSTABLE COMFORTABLE STRAP-Dual adjustable comfy and soft strap in pu leather, perfect for school, hiking , travel. *INSULATED LUNCH BAG - BPA free Lining keeps lunch, fruits, snacks or drinks the right temperature (warm or cool) up to 3 hours. Zipper Pockets at two sides for storing small things. 6 outer pockets,6 inner pockets. *SUPER EASY CLEAN - Safe and Washable Lining is BPA and Phalates fee. Stains, marks or food residues can be wipe clean easily and dry fast.